As you might remember, more than half a year ago, the very first 2014 Chevrolet Corvette Stingray got wrecked in an accident. That time, it was the very first 2014 Chevrolet Corvette Stingray crash on a public road. 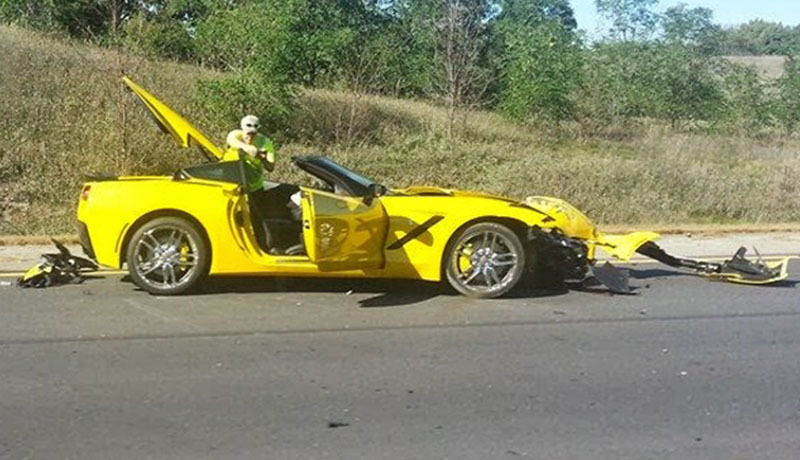 Just recently, another 2014 Chevrolet Corvette Stingray crashed at something. We don’t know how exactly it happened and what this car hit. What we know that it’s the second Stingray C7 crash in total. What we have here is just that one picture above. We can’t see how badly this car is wrecked, because we can only see one side of it. From what we can see, the crash was quite decent. In the picture above, we can see that the Stingray clearly suffered some major front-end damage. Obviously it doesn’t look too bad but nothing good either. Whoever crashed this car, he/she definitely should be not in the best mood right now. The car costs more than fifty grand USD, and it is obvious that it’s going to cost at least several thousand to fix the damage. We are sure that this is not the last crash of the new 2014 Chevrolet Corvette Stingray. Cars like it crash quite often. It is very easy to crash a car like this if you push it a little too hard. It is a very fast and powerful automobile, and you have to have some good driving skills to actually push this car hard. Everyone knows that whoever has a sports car, they usually push these cars hard most of the time. It is also obvious that at least some of these guys don’t have good driving skills to handle such cars. Accidents happen everyday. If you own a sports car, use it in a smart way, and don’t be one of those guys who get in car accidents. Everyone who has experienced a crash knows that it’s a crappy feeling.